Pasta is a staple of American cuisine these days. But not long ago most types of pasta noodles were considered pretty foreign, something only non-Americans ate. How did noodles go from alien to commonplace in American eating habits? It was a long journey in time and space, moving through many foreign countries and evolutions in eating habits to get where it is right now. 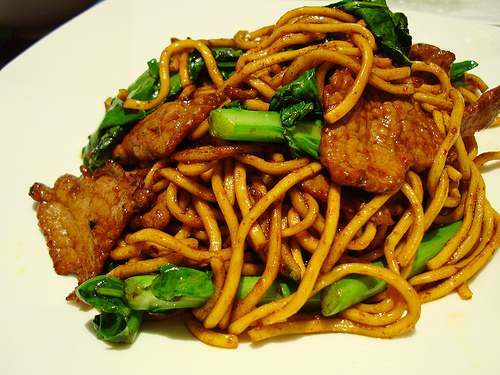 Noodles have been a centerpiece of the northern Chinese diet for millenia. 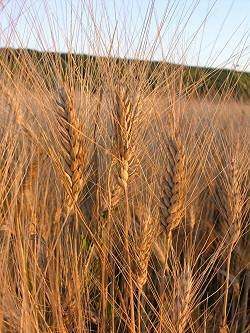 Wheat and dry-land grains have long been a basic food crop there instead of rice. Long ago, the Chinese discovered they could mix hard wheat flour with water. 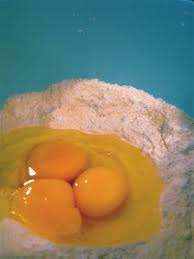 Add an egg so the paste would stick better, and the resulting dough could be stretched again and again, becoming sturdy as protein bonds formed. Stretching the noodle dough: "pulling noodles"
Dropping this mass into boiling water cooked it quickly. The result was a tender, toothsome food that tasted great with simple toppings or as part of other dishes. Noodles could also be dried and stored, but fresh ones tasted better. Noodle-making became a culinary art in China. The Venetian explorer Marco Polo traveled to China and returned to Italy in 1295. He probably brought rice flour pasta with him, a soft dough used in what became gnocchi and ravioli. It is a legend invented in the Macaroni Journal (a food industry publication) that he introduced noodles to the Italians. 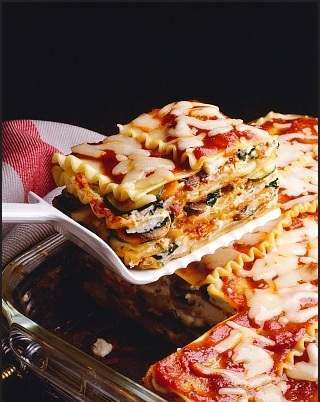 Actually, small, dried forms of pasta were eaten by early Italians, and Romans had eaten something like lasagna. 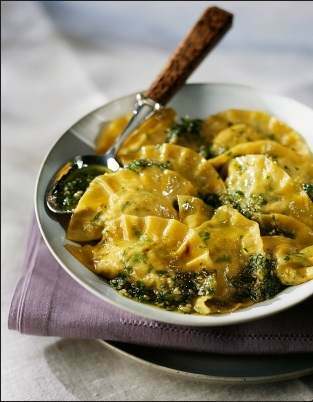 But it is true that after Polo’s return, his pasta delicacies sparked interest in noodles and cooking with dough. By the Renaissance, Venice bustled with visitors from all over Europe, and many took this Italian cooking style back home with them. 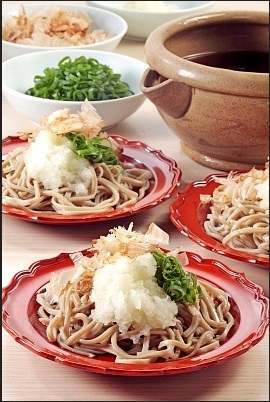 In England flat noodles became popular cooked and topped with sauce. In France in the 18th century, “maccaroni” machines were made to extrude hollow macaroni shapes. Other styles were popular in other countries. When people came to America, they brought their favorite foods with them. Still, right up until World War II, most of these dishes – spaetzle, stir-fried noodles, Italian spaghetti, and so on – were thought of as “ethnic food” eaten mostly by foreigners. Then came the War. 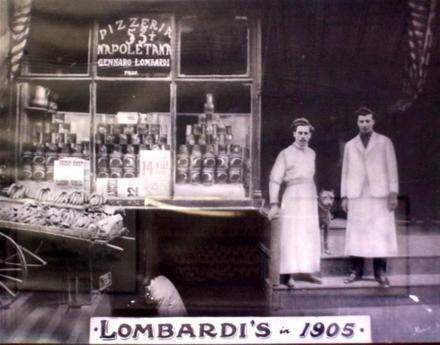 Lombardi's - the first pizza parlor in the U.S.
For the first time, masses of G.I.s were exposed to the food in Italy. They ate pizza and pasta like the Italians cooked it, and after the war Italian restaurants became more popular. Meanwhile, famous Italian entertainers like Frank Sinatra and Sophia Lauren helped put the spotlight on the “home cooking” they loved. In the ’30s, American food manufacturers introduced “new classics” like macaroni salad and macaroni and cheese, and pushed them during the frugal war years. After the war, products like Ragu spaghetti sauce, on the market since 1937, became more popular. They allowed housewives to whip up a spaghetti dinner without spending all day making pasta sauce. 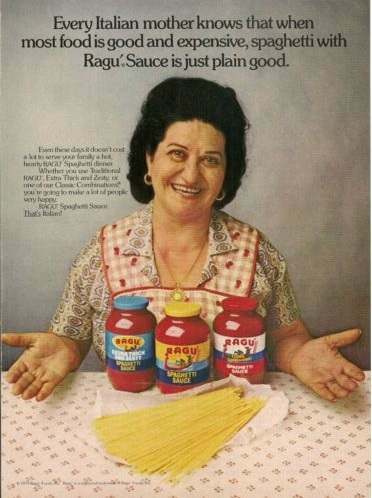 Ragu making their time-tested "good homemade food" pitch in an old-fashioned style 1980s ad. With this obstacle to ethnic cooking out of the way, Americans dove into pasta. They happily adopted Italian standards like spaghetti and lasagne, and were much more willing to try other “foreign” food that had noodles in it. 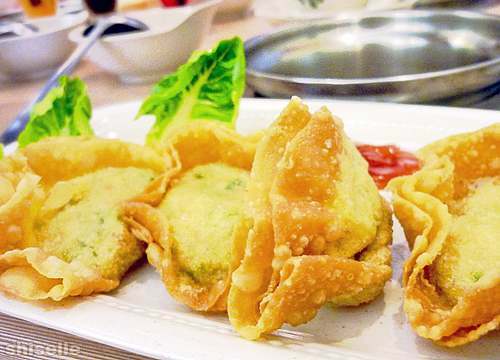 This interest helped Chinese, Thai, Vietnamese, and Asian fusion foods become popular in the late ’80s and onwards. This brought the cycle full-circle: from China, across Europe, to America, embracing Asian and other ethnic foods here at last. 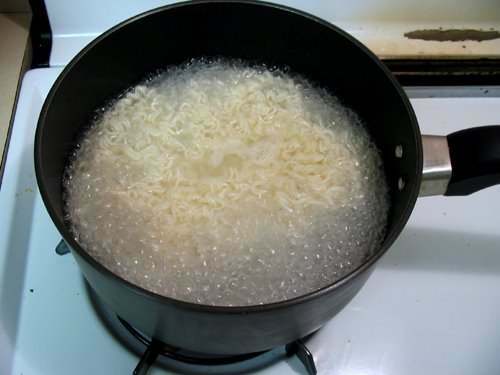 Now noodles and pasta of all sorts are mainstreamed into American cuisine. 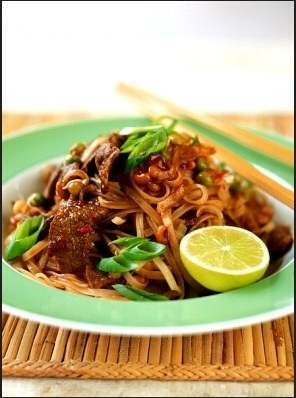 For fun cooking noodles, test drive some recipes at Google Books: Chinese, Italian, Thai. 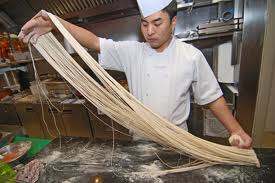 To see a chef hand-pulling noodles, see this video. 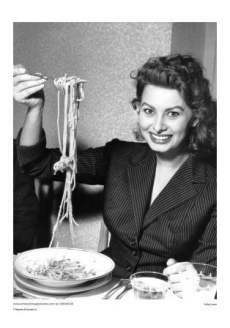 Noodles (vermicelli) were eaten in Italy LONG before Marco Polo went or came back from China. He only stated that the Chinese ate noodles as Italians did. 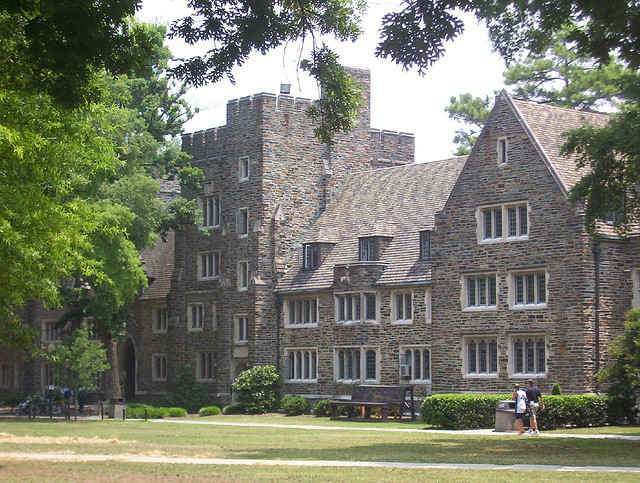 Show some proof to your hilariously fictitious comment. What David said. They’ve found early Roman recipes for lasagna and what seems to be gnocci. The Marco Polo thing is a myth.